Sigma Serves Children is the philanthropic initiative to benefit children’s health. Whether Sigmas provide play therapy grants to children’s hospitals or light their campus purple for Prematurity Awareness Month, we believe we can impact lives. 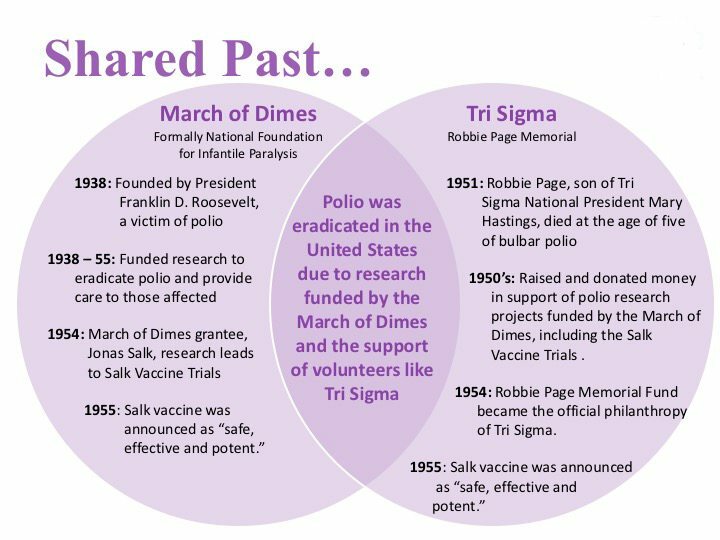 The Robbie Page Memorial Fund and March of Dimes share a common history. The Robbie Page Memorial Fund became our first national philanthropy in 1954. Then Tri Sigma welcomed March of Dimes as a philanthropic partner at the 2016 Convention. Knowing that children’s health is a priority to our members Sigma Serves Children expanded its reach. The Foundation is proud to honor Robbie’s wish of serving children. While every donation matters, we also believe that philanthropy is about personal engagement. From raising awareness in our communities for March of Dimes to creating blankets for patients at the local children’s hospital, our members, children, and communities will feel empowered through our initiatives. Because the natural progression of a child’s physical, emotional and intellectual development occurs through play, chronically ill children who are frequently hospitalized need to have the opportunity for play to occur in the hospital setting. Through therapeutic play, a child’s illness will not halt his/her development. Therapeutic play also helps hospitalized children to accept and understand their diseases and treatments, to decrease stress and anxiety, and to increase coping through developmentally appropriate support and education. Through RPM we provide grants and scholarship to serve therapeutic play/child life therapies. The RPM Fund began with Robbie Page and his story. Learn more about it’s history. The March of Dimes has led the way to discover the genetic causes of birth defects, to promote newborn screening, and to educate medical professionals and the public about best practices for healthy pregnancy. It supports research for surfactant therapy to treat respiratory distress and helped initiate the system of regional neonatal intensive care for premature and sick babies. The recent Folic Acid Campaign achieved a dramatic reduction in the incidences of neural tube defects and birth defects of the brain and spine. Since 2003, the fight to save babies has been strongly characterized by the Prematurity Campaign. The rising incidence of premature birth has demanded action, and the March of Dimes has responded by initiating an intensive, multi-year campaign to raise awareness and find the causes of prematurity. Learn about our March of Dimes partnership. "The Foundation's generosity provided Our Lady of the Lake Children's Hospital, in Baton Rouge, with $2,500 for two IPad Airs and the Radical Randy Asthma Program. Having the opportunity to enhance therapeutic play in our own local hospital, will not only honor Robbie Page's wish to serve children, but will also allow us all to make a lasting impact in our local community."